Fall is finally here: You’ve just finished that overseeding project, you’ll be tilling the garden one last time before winter sets in and your mowing is winding down. Time to winterize your tractor and mothball it for five months, right? Heck no. 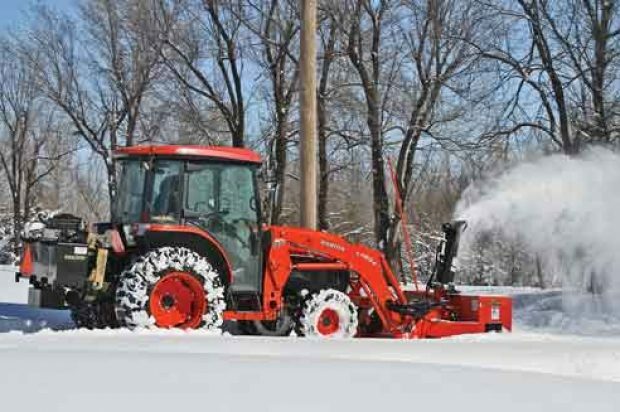 Your compact tractor was made for snow removal. Here’s what you need and what you need to know. There are a variety of implements available for snow removal. Each does the job a little bit differently, but all of them turn your tractor into an efficient tool for combating Old Man Winter. Choosing the right piece of equipment depends a lot on preference and task. Before we get started, a word of caution: It cannot be stated strongly enough that performing snow removal tasks is ripe with opportunities to hit unseen objects. Snow covers everything, hiding obstacles that pose dangers to both operators and equipment. If you are removing snow at a new location that you are not familiar with, explore the area thoroughly before beginning. If possible, examine the area prior to snowfall and mark obstacles that will create problems later. The simplest and most economical tool for snow removal is a snow pusher. A snow pusher is essentially a large box that captures the snow as you push forward. It offers a much larger capacity than the tractor bucket and can be ordered with a steel or rubber composite scraper edge on the bottom of the moldboard. The rubber edges on snow pushers are able to flex and pass over obstructions under most conditions and offer protection to the asphalt or concrete below. Some manufacturers also offer the steel edge option with a trip mechanism that serves the same purpose. Because of the volume of snow that a pusher can move, they make quick work of parking lots and other large, open areas. Snow pushers do not windrow snow like traditional angled blades do — they push straight forward — and pile snow at a chosen location. Widths vary from manufacturer to manufacturer, but small pushers start at about 4 ft up to large commercial pushers that can be 30-ft wide or wider; obviously, wide pushers are for large high-horsepower tractors. Compact tractor models are generally going to be in the 4- to 8-ft range with moldboards from 18 to 30 in. high. Optional equipment that make snow pushers more versatile include pull-back blades that allow you to rotate the box 90 degrees and rake snow away from garage doors or buildings. Abrasion-resistant skid shoes are available from some manufacturers as well as side markers to help locate the corners of the pusher in deep snow. Compact tractor pushers can start at $600 and go up to $1,200 to $1,400 depending on size and options. Front- and rear-mount blades have been a staple of snow removal for decades. They are simple, easy-to-use and most are versatile enough to serve a dual purpose in the months when snow is not an issue. Blades come in a variety of sizes, and mounting options range from front-mount with two-lever quick-attach, tractor-specific mounts, sub-frame mounts and a three-point hitch. Blade styles include a fixed blade, angling blade, trip blade, trip-edge blade or a six-way blade. Traditional three-point blades are common for snow removal and can be used to move dirt or grade roads in the summer. Generally speaking, a rear-mounted blade can be used both moving forward or backward. The drawback to forward travel is that the snow is packed down by the tractor prior to removal by the blade. For backward travel (pushing) use, the blade will need to be rotated 180 degrees, and the pushing action is hard on the blade sometimes resulting in damage. Three-point blades can start as low as $600 for a quality, compact tractor model. Front-mounted blades are very popular snow removal tools. They are easier to use than a rear blade and easier to install and uninstall (with the two-lever hitch), and it frees up your tractor’s three-point to use a salt or sand spreader at the same time. The largest benefit of a front-mounted blade is that the snow is removed while driving forward. The downside to front-mount blades is that some manufacturers require an expensive and cumbersome sub-frame for blade hookup. This often requires removal of the loader. Either way, the bucket will not be available for use, which sometimes comes in handy when moving snow. Optional equipment that make snow pushers more versatile include pull-back blades that allow you to rotate the box 90 degrees and rake snow away from garage doors or buildings. Front blades come in varieties with moldboards or edges that trip, angling options, or models that transform into V-blades, also called six-way blades. All of these extras add up to cost significantly more than a three-point blade. A quality front-mount blade with hydraulic capabilities can start at around $2,000 and go up from there. The ultimate in compact tractor snow removal is a snow blower. Like blades, snow blowers come in both front and rear mount and have similar pros and cons. Rear-mount snow blowers either require the operator to drive in reverse to remove the snow or to use a pull-type and drive over the snow before it’s blown. Front-mount blowers often require expensive sub-frames and a mid-mount power take-off (PTO). Loader-mount snow blowers are available, but because of restrictions with the hydraulic capabilities of tractors, they require hydraulic power packs that often make the package an unaffordable option. Like front-mount blades, the bucket and/or loader must be removed to use a front snow blower. Tractor snow blowers work much the same way a two-stage, walk-behind snow blower works. Gearboxes driven by the tractor PTO transfer power to the auger and impeller. The augers direct snow to the center of the blower and into the impeller. The impeller throws the snow upward through a chute. Snow blowers can have manual, hydraulic or electric chute rotation, allowing the operator to direct snow to a desired location. Adjustable deflectors on the chute also aid in directing the snow. Snow blowers allow operators to move snow quickly in one pass. Options like cutting edges and skid shoes allow users to outfit their blowers for the task at hand. Three-point snow blowers can start at $2,500 and go up to as much as $4,500. Front-mount snow blowers with the required sub-frame can begin at more than $4,000. 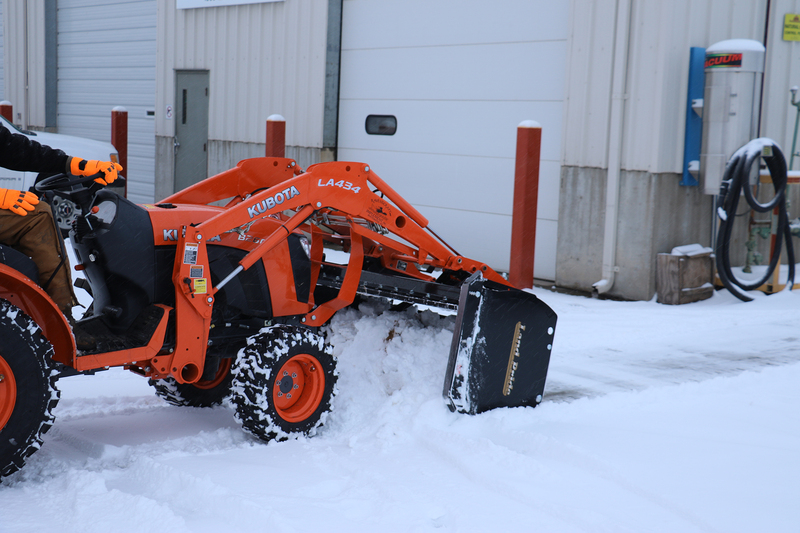 No matter what you pick to remove snow, your compact tractor will make the task easier. Some simple reminders for snow removal: Inspect the area, dress appropriately and perform recommended maintenance on both your implement and your tractor. Snow removal can be hard on your equipment, especially if you are also using a de-icer. The corrosive properties of de-icers mean that it’s imperative that you properly clean and lubricate the exposed contact points. Manufacturers offer a suggested maintenance schedule in their operator’s manuals. They are meant to be followed, but use in snow may require more frequent maintenance. Clean your equipment after every use. If you are using an implement with a gearbox, make sure you check oil in the gearboxes prior to use, grease drivelines and pivot points before and after use, replace wear items like skid shoes when worn and touch up the paint to prevent rust. With proper care, your snow tools will last for years to come. Dee Warren is the marketing manager with Land Pride.